Our pub chalkboards are designed to make your business stand out on the high street. We understand how the quality of an A Board reflects the business it is advertising, so we always make sure our outdoor A Frames are made with quality in mind. We now offer our Champion's Chalkboard range. These A Boards make use of an Easy-to-Clean panel to make using a liquid chalk pen even easier! They are strong, durable and made to last! If you can't see the size or style you like, just get in contact today for a bespoke quote. 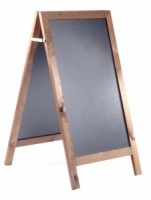 A traditional free standing chalkboard in the popular A Board style. If you need a large quantity or are a trade customer, get in contact with us directly and we can give you relevant price breaks on the products you require. All of the materials used to craft our Chalkboards have been researched to ensure that they all come from sustainable sources, this helps us to maintain our quality and our carbon footprint.